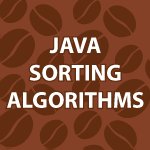 Welcome to my Java sort algorithm tutorial. Here I will cover all of the elementary sorting algorithms : Bubble, Selection and Insertion sort. I also created a new method we can use to analyze the arrays so we can learn how the sorts work. I want this video to be very interactive so that you really understand the sort algorithms. I also cover the linear and binary search algorithms. The code below will help you learn these algorithms perfectly. // only partially sorted here. i always have a confusion, why we use two looping statements in sorting algorithms, it may looks silly question, but need some clarification. i will post again if i will have questions. I’ll make sure I cover it when i get back into algorithms. Hey Derek great tutorial as always, I was wondering if you can apply the same algorithm to Doubly Linked List and can you make a tutorial video of it. Yes pretty much. I cover the doubly linked list here. I was asked in the interview, how will you sort an array with 1 million values in it? Please let me know your thoughts on this. QuickSort is normally faster then heap sort because of how it manages data in memory, but QuickSorts worst case performance is considerably worse then Heap Sort. sorted array as the outer for loop iterates n-2 times when it should be iterating n-1 times. and then call the bubbleSort function. Just want to say that I’ve been learning more about serious problem solving in your tutorials than any other resource on the internet or otherwise. I take my hat off and thank-you. I’m very happy to hear that my tutorials have helped 🙂 Thanks for taking the time to tell me. Please Someone Post a Flash Sorting Program code !!! Derek……you have been my online teacher and mentor for about 2 months now….and will continue to be for a long long time….thanks for taking your time to do allthe great stuff.